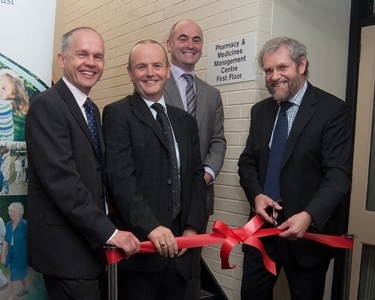 A new Pharmacy and Medicines Management Centre at Antrim Hospital, Northern Health and Social Care Trust, was officially opened on 4 October 2010 by Dr Norman Morrow, the Chief Pharmaceutical Officer at the Department of Health Social Services and Public Safety. Dr Morrow said “I am delighted to participate in the opening of this new facility today. Professor Scott and his team have made a major contribution to the delivery of Clinical Pharmacy Services in Northern Ireland and to the Department’s Pharmaceutical Clinical Effectiveness Programme. This is a timely opportunity for me to pay tribute to their industry and innovative practice and record my thanks for all that you have done to date. I hope this new Centre will facilitate your work further and indeed provide advantage to the whole of the HSC”. The relocated Pharmacy and Medicines Management Centre will centralise pharmacy services in one place, providing a more effective, efficient service. The centre will be engaged in re-engineering medicines processes together with the integration of novel health care technologies to optimise medicines use. This will lead to innovative ways of providing safe effective and economic medicines utilisation that will be generalisable across the UK health sector and further afield. The new centre will also collaborate with academia and industry on R&D projects in these areas. Mr Sean Donaghy, the Trust Chief Executive was also present and he commented on the contribution that the team had made to improving clinical care in the Northern Trust and across Northern Ireland. He welcomed the creation of the centre to bring together the expertise of the team and looked forward to continued leadership for pharmacy and medicines management across Northern Ireland. Dr Flanagan, Trust Medical Director, also paid tribute to the work being done by the pharmacy team. The opening followed on from a short seminar with presentations made by Dr David Brownlee from HSC Innovations, Dr Jill Mairs, Regional Procurement Pharmacist and Professor Mike Scott, Head of Pharmacy and Medicines Management, NHSCT. EPICS (Electronic Pharmacist Intervention Clinical System) – This is a pharmacist interventions system developed in conjunction with both the School of Pharmacy, Queen’s University Belfast and Yarra Software Ltd, and is used to record pharmacist interventions based on a grading scale of 1 – 6 which relates to the degree of impact on improving patient care as a result of pharmacy action. See more in a previous post – NHSCT and Yarra Software Share Revenue from Pharmacy Technology. 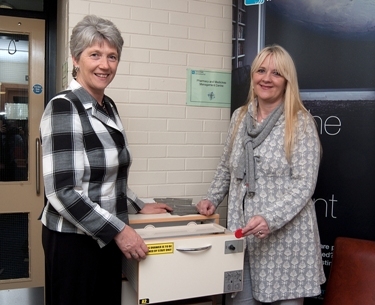 Keyless Locker – This initiative, developed by the Trust in conjunction with Hospital Metalcraft Ltd, was also displayed and the rationale for its development highlighted. The keyless locker system is a fob operated locker whereby patients can access their own medicines as required in line with Audit Commission recommendations. The lockers are also linked to a computerised system that monitors and records use by both patients and staff. Dr David Brownlee of HSC Innovations commented “The Pharmacy and Medicines Management Centre will become the essential cornerstone for future research and development in this very important area. It will provide that fundamental realisation for both academic and industry partners, that by working with a centre of clinical excellence such as this, it is much easier, much quicker and with a greater likelihood of success in developing new healthcare products”. To contact the centre: Pharmacy and Medicines Management Centre, 1st Floor, Beech House, Antrim Area Hospital Site, 45 Bush Road, Antrim, BT41 2RL; tel: 028 9442 4945.